It's a day after the events of part 3, and Jason (Richard Brooker) has somehow survived the wounds inflicted on him. He steals some clothes and murders a middle-aged couple. Meanwhile a fresh group of teenagers has arrived in the area, led by Chris (Dana Kimmell) who was attacked by a deformed looking man a few years ago in the very same woods. Soon enough, Jason takes up his routine of hunting down and murdering anyone dumb enough to be wandering around the woods near Crystal Lake. Along the way he dons a now very familiar piece of hockey equipment for the first time. Friday the 13th part 3 builds on what worked in part 2 and is a much more successful film for it. There is much more attention devoted to teasing the moments when Jason goes in for the kill, and as a result, this entry becomes a much more enjoyable experience. Part 3 was originally presented in 3-D, and those moments are beyond gimmicky. Occasionally there are attempts to use it to effect, but most of the time it’s just an excuse to shove random crap at the camera. This is noted for being the film where Jason finally gets his iconic hockey mask, but since the filmmakers had no idea how important this moment would become, it plays out with no fanfare whatsoever. Part III’s biggest flaw has nothing to do with its production, most of its gore was removed at the behest of the MPAA, and for whatever reason, finding an uncut version has proven difficult. 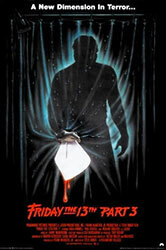 As a result, Friday the 13th part III is a relatively toothless but fun addition to the series.